Oreo Rocky Road Bark is a twist on a familiar favorite. Regular rocky road is good, but what couldn't be improved with the addition of an Oreo or two? This quick and easy bark is made from just four ingredients, and it has something for everyone. Chewy marshmallows, crunchy nuts, cream-filled cookies, and of course a thick layer of chocolate holding it all together! I love to try this recipe with flavored Oreos too--the berry and mint varieties are two favorites. Coarsely chop the cookies and the toasted nuts into small pieces. Place the chopped chocolate or chocolate candy coating in a large microwave-safe bowl and microwave in 30-second increments until melted, stirring after every 30 seconds to prevent overheating. Once melted, stir until the chocolate is smooth and set aside. Add most of the cookies, marshmallows, and chopped nuts to the melted chocolate and stir until they are evenly coated. Reserve a few spoonfuls​ of each mix-in to use to top the bark. Scrape the mixture out onto the prepared baking sheet and spread it into a thin layer. Sprinkle the top with the reserved cookies, nuts, and marshmallows. 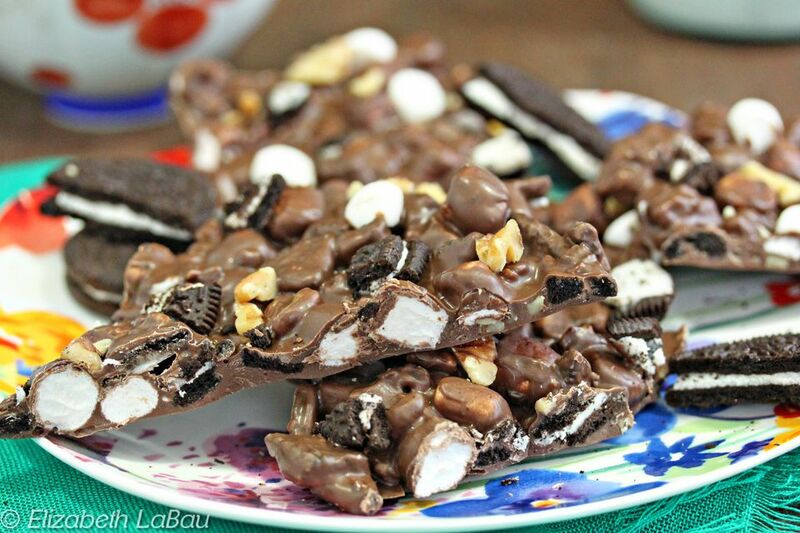 Refrigerate the tray to set the Oreo Rocky Road Bark for 20-30 minutes. Once the chocolate has set, cut the candy into small squares or break it into small pieces by hand. Store Oreo Rocky Road Bark in an airtight container at cool room temperature for up to two weeks. Click Here to View All Rocky Road Recipes!